It’s no secret that homeschooling can sometimes be difficult for a highly sensitive person under normal conditions. Add in the holidays, and BAM (Oooo, sorry…. bam) and you have a recipe for a very stressful time. Particularly if you have children who are also highly sensitive. 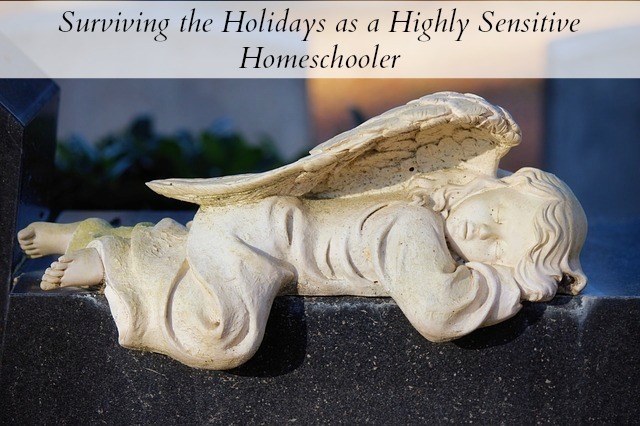 My number one suggestion – homeschool as little as possible in December. Unless you are working through an outside homeschooling entity with set deadlines, like a cyber school or live video class, I highly suggest cutting back on anything that looks “schooly” for the month of December. It’s a fantastic time to make use of family oriented activities that can be counted as educational time with the right mindset. And this doesn’t just have to be for the little kids, with planning even high schoolers can “life school” in December. You have so much to do – do it anyway and turn it into learning. Everything you do and talk about can have educational value. It doesn’t have to look like what you did in school to be real learning for you and your children. Some years we have kept some basics – a page of math or phonics every day, for example, with the rest of the time for more holiday-like pursuits, or just chilling. A high schooler who needs to continuing working could pick their easiest or favorite subject to focus on that month, getting ahead in that, saving time for less desired subjects later. Other years we have had a loose theme like “Advent” or “Christmas Around the World.” When I say loose, I mean loose – finding some library books or documentaries, or searching on the computer and reading it aloud to the kids…picking a few things from Pinterest, whatever worked for us that year. I would base it on the children’s interests, so they were instrumental in driving the quest for information. Early December declutter: My kids helped go through old toys and clothes to make room for new. Discussed (in a natural way, not lecturing!) children that don’t have as much, what life is like in other parts of the world, benefits of living simply, what things are worth, budgets, history of Christmas and gift giving, etc. These things can count as social studies, economics, math, and more. And because it was a loving, enjoyable time, they remember the lessons much more than if they read a textbook or did a workbook page. Yes, more than half the time was spent playing with the things they found that had been forgotten, but that’s OK! Read alouds: (the following links may be affiliate links) December is wonderful for sitting around with tea or hot cocoa and reading aloud together as much as possible. It’s a great way to bring the family together in a rejuvenating way. I’m not saying it’s always easy, I do remember blogging years ago about “shout reading” over my toddlers. But you know? I realized I was the only one having a problem with that. When I changed MY attitude about it, we *all* had a good time. My children always ask for the Arnold Ytreeide Advent books. We’ve read them a number of times and they quote from the funniest parts all through the year. They are meant to read a section a day, but we always start late and/or get behind, and you know what? It doesn’t matter. It all seems to work out in the end. Let the discussion flow freely from your read alouds, and they can cover any topic you need to cover in your regular schooling. There are living books out there on almost anything! If you are Catholic and have kids that enjoy picture books, Elizabeth Foss’s Tomie DePaola Unit is engaging and enriching. I also can’t say enough good things about audiobooks. We’ve spent many hours in the car learning and enjoying someone else read aloud on a CD. Saves my voice and my energy, makes good use of a time and space that often led to bickering (the car after a long day). A well done audio book is a treasure! Crafts and cooking: Let me tell you, I am no fan of paper and scissor crafts, glue, glitter, etc. The more mess it makes, the more I dislike it. There is so much more out there! Here’s one place I find Pinterest comes in handy. I enjoy crafts that serve double duty as decorations or gifts. Know your limits. If cutting snowflakes or using glitter makes you feel like strangling baby animals, don’t do it! Be strong and say no. “Kids, a happy mommy is a MUCH greater gift to you this year than 15 glitter snowmen!” *big sincere smile*. This is one relatively non-messy craft we’d like to try. Perhaps we’ll decorate the tree with the “yarn snake” that comes out. I’ve seen lots of different ways to do this, so if you don’t like hers, there are plenty more on YouTube that show other slightly different ways. Screen time: If your children can handle it, judicious screen time can be good down time. So many things are educational and can count as school –selective use of documentaries, apps like Dragon Box, computer programs like Timez Attack, and in our case Christmas specials! Focusing on Music and Art: If a year’s worth of art and music gets taken care of in December, that will free up the rest of the year for more time in the other subjects, assuaging a little guilt for not doing math again today. 😉 Practicing for a holiday play most likely covers music and language arts goals as well (memorizing, vocabulary, public speaking, diction, etc) . Between crafts, holiday songs of all kinds, gorgeous artwork on holiday themes, and more, so much can be learned in these subjects during December in an enriching and holistic way. If school absolutely must be done in a school-y way for whatever reason, see if you can at least cut down on the number of pages or problems. Does the child understand the math concept being taught? Move on after a practice problem or two. Do they need to do all 30 problems on the page or will they have had enough practice after 5 or 10? Or, are they burning out after 5? No good learning will go on after that anyway, move on to something else. In the end, you know what will work best for your own family. My particular suggestions work for me and us, but may not be what will build YOU all up as a family or work with your particular sensitivities. Just ask yourself why you are doing each thing during the busy holiday season. Is it building you up? Improving relationships? Let love be your guide, but remember, YOU are part of that equation – things need to be loving to you as well, and not always stressful. Hope you all have the most blessed of holiday seasons!